There once was a time when food sold out of a cart or truck on NYC streets was considered unappetizing, not to mention a surefire way to contract food poisoning. Besides the occasional soft pretzel or bag of roasted nuts, most people never considered stopping at these places for an actual meal. However times have certainly changed, and street food has increased from pretzels and hot dogs to falafel, gyros, tacos, and most recently: waffles. 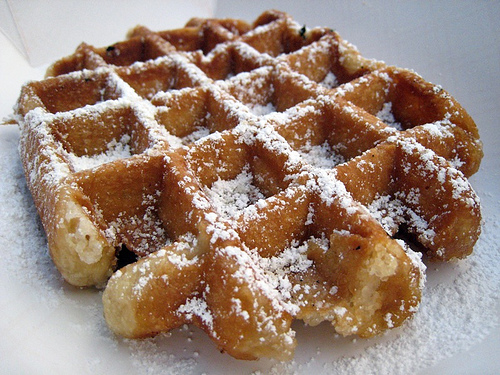 Last summer, a man by the name of Thomas de Geest (of Belgian decent, naturally) decided the city was lacking in sweetness (no kidding) and came up with an authentic belgian waffle truck called Wafels & Dinges – meaning "Waffles and Things." The "wafels" offered are the traditional light brussels wafel; the liege wafel which is a chewy waffle packed with sugar; or the cinnamon wafel. The "dinges" are toppings for your "wafel," ranging from strawberries and whipped cream to nutella and dulce de leche. Stop salivating. You can find this truck Monday-Friday from 8 Am-11 Am on Park Ave between 26th and 27th street, or from 3-9:30 PM at 14th street and 3rd avenue by Trader Joes. "Warning!!! Be Ready! We sell authentic Belgian Waffles! Unparalleled to any other waffle! Who has superseded us in bringing authentic Belgian waffles into NYC streets? No One! We did it! Waffle4U did it!"